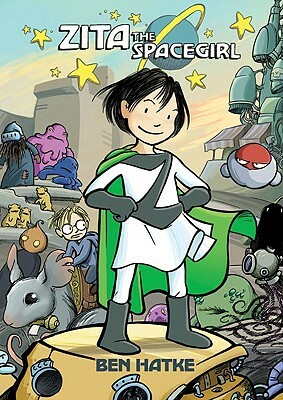 Zita the Spacegirl by Ben Hatke. Grades 4-7. First Second, February 2011. 184 pages. Review copy provided by my local library. When Zita pushed the button, she opened a portal to another planet. And to save the day, she'll have to count on the help of some very special new friends. Seriously, I can't do the plot justice with my words, so check out this awesome book trailer instead. Go on, I'll wait. Zita the Spacegirl: Trailer from Ben Hatke on Vimeo. This book totally charmed me! I picked it up to flip through it when I saw it on our new books cart and I ended up checking it out and taking it home to read the whole thing. This is a book bursting with imagination! The clear, bright artwork shows a great range of tones and emotions. What hooked me on the book is the humor, especially portrayed in characters' expressions. With simple moments and little details in the pictures, Ben Hatke brings the laughs. He's equally skilled in presenting tense and emotional moments. The moments when Zita realizes what she's done, that she's responsible for her friend being taken, are extremely poignant. Zita's a wonderfully brave and steadfast little girl. She fights for the little guys and always helps her friends. She's maybe a little too impulsive for her own good, but her heart's in the right place. It's great to see a spunky girl protagonist in a science-fiction story and I'd wager to say that with a plethora of aliens and robots, this is a story that'll appeal to both girls and boys. I'd hand this one to fans of sci-fi adventure stories like maybe Gregor the Overlander by Suzanne Collins or Larklight by Phillip Reeve. Also, the art reminds me of Smile by Raina Telgemeier or Robot Dreams by Sara Varon, so I'd try this on fans of those graphic novels as well. Zita the Spacegirl is on shelves now and it leaves the way for many a sequel (woohoo! ), so you can bet I'll be looking out for those.